Previously tipped to become an OLED panel supplier to Apple for future iPhones, Sharp is thought to be increasing its efforts to create the panels specifically for smartphones. The company is believed to have started to roll out a production line just for the smaller panels, in anticipation of orders. According to Digitimes, the Foxconn-managed vendor hopes to be tapped by Apple for its smartphone OLED panels in the iPhone. In theory, this would put Sharp directly in competition with Samsung, which enjoys the position of being Apple's primary iPhone OLED panel supplier. LG is a secondary provider, added to the roster in September to help with iPhone XS panel production, and in November reportedly started mass production of 400,000 OLED panels for Apple. 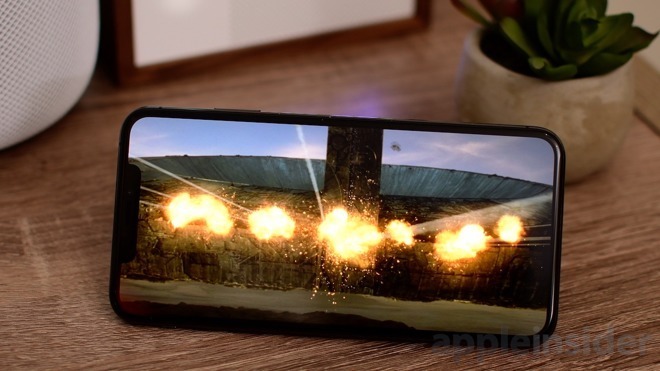 Apple's OLED providers are likely to enjoy more orders in the future, after one recent report suggested Apple was shifting to an entirely OLED-based lineup for the 2020 iPhone launches. If true, this would make 2020 the first year where Apple doesn't produce an LCD-based iPhone. The Digitimes report suggests the boon to production is not only limited to iPhones, but to the OLED industry as a whole. Taiwanese IC producers and related firms are said by industry sources to be expected to grow their business in 2019. Smartphone vendors in generation are expected to shift more towards OLED displays in mid-range models throughout the year, rather than just for flagship models. Foldable smartphones are also reportedly thought to be a focus for development by some firms. It would be nice if they can do that for iPad Pros. But microLED should be the future for desktop monitors considering that way many of us tend to leave the monitor still running unattended too long. OLED monitors for desktops is a recipe for disaster since we'll see a lot of burn ins (even OLED still burn in with latest technology but can tolerate longer hours - and remember, that burn in happens when you have static elements always on like a Dock and menu which will likely burn in after prolonged use.